Nuclear waste repositories are now being built to store spent fuel rods for the next one hundred thousand years or so. This model shows a hypothetical case where a breach in the fuel bundle canister leads to leakage through a fracture in the surrounding rock and backfill in the tunnel above. 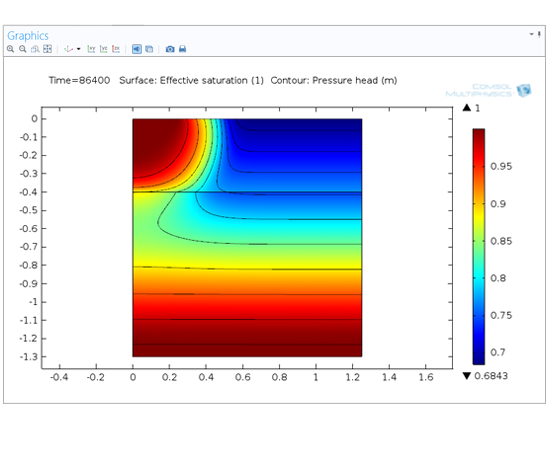 The Subsurface Flow Module is for engineers and scientists who want to simulate fluid flow below ground or in other porous media and also connect this flow with other phenomena, such as poroelasticity, heat transfer, chemistry, and electromagnetic fields. It can be used for modeling groundwater flow, the spread of waste and pollution through soil, the flow of oil and gas to wells, and land subsidence due to groundwater extraction. 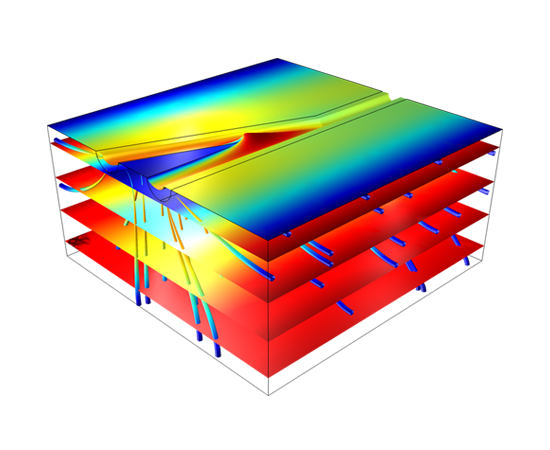 The Subsurface Flow Module can model subsurface flow in channels, saturated and variably saturated porous media, or fractures, and couple these to simulations of solute and heat transport, geochemical reactions, and poroelasticity. Many different industries need to deal with challenges within geophysics and hydrology. Engineers from the fields of civil, mining, petroleum, agricultural, chemical, nuclear, and environmental engineering often need to consider these phenomena as the industries they work in directly or indirectly (through environmental considerations) affect the Earth on which we live. 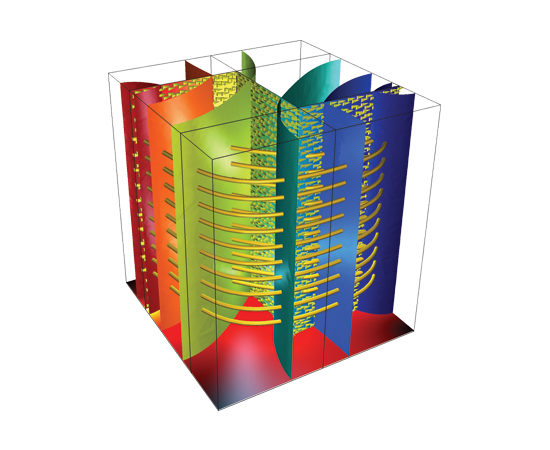 Contained within the Subsurface Flow Module are a number of tailor-made interfaces describing certain physics for the modeling of flow and other phenomena in subterranean environments. 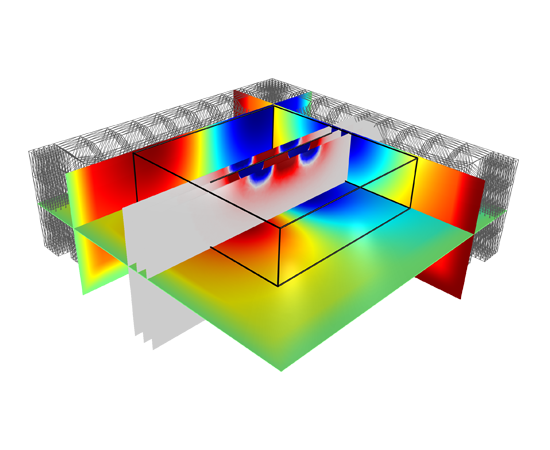 Known as physics interfaces, they can be combined and directly coupled to other physics interfaces within the Subsurface Flow Module, or with physics interfaces within any of the other modules in the COMSOL Product Suite. This includes coupling the poroelastic behavior described by the Subsurface Flow Module to nonlinear solid mechanics applications for soil and rock in the Geomechanics Module. 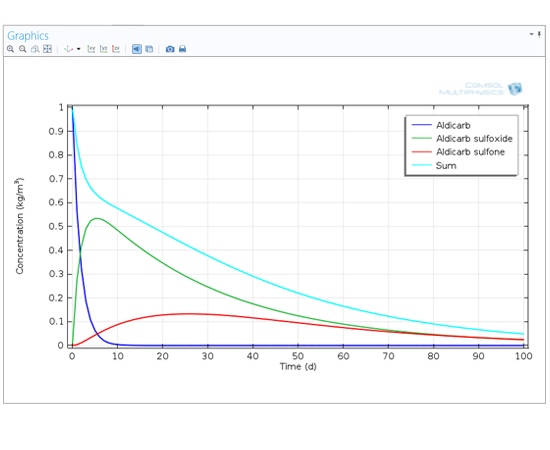 COMSOL gives you the flexibility to enter any arbitrary equations within the edit fields in The Subsurface Flow Module's physics interfaces, which can be useful for defining geochemical reaction rates and kinetics in the interfaces for material transport. Yet, coupling these physics interfaces with the Chemical Reaction Engineering Module means that you can model many multi-species reactions with the easy-to-use physics interfaces for defining chemical reactions that this module contains. Integrating these two products is very useful for modeling the many reaction steps involved in the spread of nuclear waste from their repositories over thousands of years. Typical geoelectrical surface electrode array on the surface of the ground. Sensitivity density for the Wenner-alpha configuration is shown, along with the electric potential. 3D compaction of an oil reservoir brought about by pumping, coupling Darcy’s law to displacements brought about through poroelasticity. Flow in a block of porous media with a fracture where flow in the fracture is much faster than in the rest of the porous media. The modeling approach uses internal boundaries for modeling the free flow in 2D, while modeling the porous media flow in 3D using Darcy's law. Produced by scanning electron microscope images, the geometry of microscopic pores can be imported to COMSOL where the velocity and pressure distributions are then calculated. Model courtesy: Arturo Keller, University of California, Santa Barbara. Water on the ground moves into a relatively dry soil column and carries a chemical with it. As it moves through the variably saturated media, the chemical attaches to solid particles, slowing the solute transport relative to the water. Additionally the chemical concentrations decay from biodegradation in both the liquid and the solid phase. Shown is the saturation and pressure head contours. The degradation of a pesticide in an unsaturated soil. Shown are the biodegradation of the pesticide and intermediary products over time. The core functionality of the Subsurface Flow Module is its ability to model flow in variably saturated and fully-saturated porous media. The physics interfaces are set up using terms like pressure and hydraulic heads, that are familiar to the engineer that models hydrology. In variably saturated flow, hydraulic properties change as fluids move through the medium, filling some pores and draining others. Richards’ equation is employed to model this type of flow, and the van Genuchten and Brooks and Corey formulations can be applied to take retention in the pores into account. Edit fields exist for the density, dynamic viscosity, saturated and residual liquid fraction, hydraulic conductivities, and storage models. Saturated porous media flow can be modeled through either Darcy’s Law or Brinkman's extension to Darcy's Law, depending on the size of the pores involved. If the pore is such that viscous effects to the fluid flow can be ignored, then Darcy's Law can be used, and flow is described exclusively by the pressure variable. If the size of the pores are large enough that the fluid can impose momentum changes through shear effects, then the Brinkman equations are to be applied. They solve for the same variables as the Navier-Stokes equations, but include terms that consider the porosity of the media the fluid is flowing through. The Fracture Flow interface also solves for pressure on internal (2D) boundaries within a 3D matrix, and is automatically coupled to the physics describing the porous media flow in the surrounding matrix. This approximation saves you from meshing the actual fractures and the computational resources this entails. If a fluid happens to flow from one medium to the other (and back) in the same model, all of the porous media physics are automatically coupled to descriptions of free flow within the Subsurface Flow Module. Channels or large connected pores are also found underground and are better modeled using the equations for fluid flow. This also includes wells and the like in applications such as extracting oil. 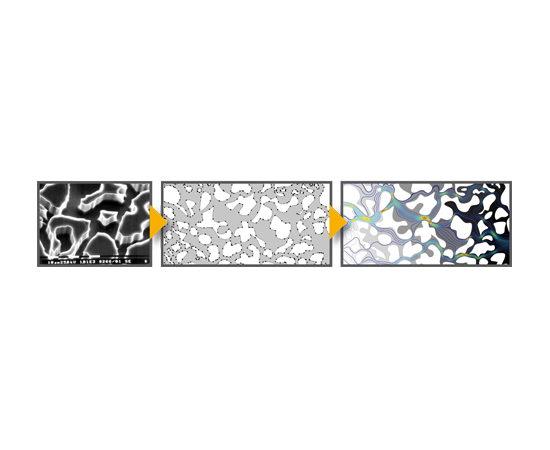 The Subsurface Flow Module supports two types of free-channel flow: laminar and creeping flow. The Laminar Flow interface solves the Navier-Stokes equations while the the Creeping Flow interface solves a modified version of this, neglecting the inertial term. Also referred to as Stokes Flow, Creeping flow is useful for flows with very low Reynolds numbers. Material transport can be coupled to subsurface flow and can occur through convection and diffusion. Properties, like diffusion, can be described by equations dependent on the variables, such as concentration, or be made anisotropic. The Solute Transport interface adds dispersion and retardation due to sorption as a transport mechanism. Dispersion considers the fact that solute transport often occurs in the direction of the flow, and the dispersion tensor is available to take this into account. Sorption describes the process when chemical species absorb and then desorb at differing rates to particles within the porous media. Its affect on the transfer of material is described using either a Langmuir or Freundlich isotherm, which are available in the interface, or through your own expression. Sorption also contributes to slowing the flow through the retardation factor. A factor for volatilization, or the dispersion of chemical species from the solute to the immobile gas phase, is also available for non-saturated flow. You can also enter your own equations to describe any reactions taking place during the material transport. The Solute Transport interface can be coupled to any appropriate physics interface in the CFD Module if you want to model two-phase flow and the solute it transports. Heat transfer occurs through conduction, convection, and dispersion, and must take into account the different conductivities that occur between the solid and fluid phases. In many cases, the solid phase can be made up of differing materials with different conductivities, and there can also be a number of differing fluids. Mixing rules are provided for calculating the effective heat transfer properties in the Heat Transfer in Porous Media interface. This also contains expressions for heat dispersion due to the nature of the porous media, as well as a term for the background geothermal heating. Dispersion is caused by the tortuous path of the liquid in the porous medium, which would not be described if only the mean convective term was taken into account. Compaction and subsidence modeling is enabled by a very powerful physics interface for poroelasticity. The Poroelasticity interface combines a transient formulation of Darcy’s law to a linear elastic solid mechanics of the porous media matrix. The poroelasticity coupling means that the fluid flow affects the compressibility of the porous medium, while changes in volumetric strains will in turn affect the momentum, material, and heat transport. This interface includes an expression of the stress tensor, as a function of the strain tensor and the Biot-Willis coefficient. The Poroelasticity interface couples Darcy's law and solid mechanics to assess deformation of porous media that results from fluid withdrawals. The model builds on top of the Terzaghi Compaction example. Results from Terzaghi compaction and Biot poroelasticity analyses are compared to each other and are a good match to published analyses. This is a tutorial model of the coupling between flow of a fluid in an open channel and a porous block attached to one of the channel walls. The flow is described by the Navier-Stokes equation in the free region and a Forchheimer-corrected version of the Brinkman equations in the porous region.